Eltronicschool. - One of the popular electronic book that usually to be reference for many electronic lecture and high students in collage is Electronic Devices and Circuit Theory that authored by Nashelsky and Robert Boylestad. This book will allow us to study basic electronic as like about diodes, transistors, FET, operational amplifier,etc. This book very easily to learn because this book completed with example that will make us easy to understand. Beside we will give you the description about the 11th edition of this book of Electronic Devices and Circuit Theory, we also will give you the link to take free download e-book of Electronic Devices and Circuit Theory 11th edition from external server. 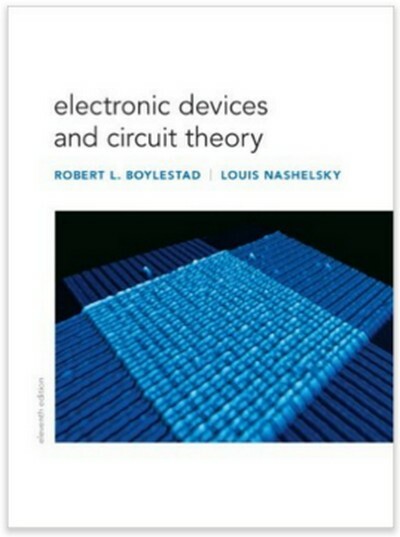 This is a book of Electronic Devices and Circuit Theory 11th Edition by Boylestad for you. The preparation of the preface for the 11th edition resulted in a bit of reflection on the 40 years since the first edition was published in 1972 by two young educators eager to test their ability to improve on the available literature on electronic devices. Although one may prefer the term semiconductor devices rather than electronic devices, the first edition was almost exclusively a survey of vacuum-tube devices—a subject without a single section in the new Table of Contents. The change from tubes to predominantly semiconductor devices took almost five editions, but today it is simply referenced in some sections. It is interesting, however, that when field-effect transistor (FET) devices surfaced in earnest, a number of the analysis techniques used for tubes could be applied because of the similarities in the ac equivalent models of each device. We are often asked about the revision process and how the content of a new edition is defined. In some cases, it is quite obvious that the computer software has been updated, and the changes in application of the packages must be spelled out in detail. This text was the first to emphasize the use of computer software packages and provided a level of detail unavailable in other texts. Throughout the chapters, there are extensive changes in the problem sections. Over 100 new problems have been added, and a significant number of changes have been made to the existing problems. A significant number of computer programs were all rerun and the descriptions updated to include the effects of using OrCAD version 16.3 and Multisim version 11.1. In addition, the introductory chapters are now assuming a broader understanding of computer methods, resulting in a revised introduction to the two programs. Throughout the text, photos and biographies of important contributors have been added. Included among these are Sidney Darlington, Walter Schottky, Harry Nyquist, Edwin Colpitts, and Ralph Hartley. New sections were added throughout the text. There is now a discussion on the impact of combined dc and ac sources on diode networks, of multiple BJT networks, VMOS and UMOS power FETs, Early voltage, frequency impact on the basic elements, effect of RS on an amplifier’s frequency response, gain-bandwidth product, and a number of other topics. A number of sections were completely rewritten due to reviewers’ comments or changing priorities. Some of the areas revised include bias stabilization, current sources, feedback in the dc and ac modes, mobility factors in diode and transistor response, transition and diffusion capacitive effects in diodes and transistor response characteristics, reverse-saturation current, breakdown regions (cause and effect), and the hybrid model. In addition to the revision of numerous sections described above, there are a number of sections that have been expanded to respond to changes in priorities for a text of this kind. The section on solar cells now includes a detailed examination of the materials employed, additional response curves, and a number of new practical applications. The coverage of the Darlington effect was totally rewritten and expanded to include detailed examination of the emitter-follower and collector gain configurations. The coverage of transistors now includes details on the cross-bar latch transistor and carbon nanotubes. The discussion of LEDs includes an expanded discussion of the materials employed, comparisons to today’s other lighting options, and examples of the products defining the future of this important semiconductor device. The data sheets commonly included in a text of this type are now discussed in detail to ensure a well-established link when the student enters the industrial community. Updated material appears throughout the text in the form of photos, artwork, data sheets, and so forth, to ensure that the devices included reflect the components available today with the characteristics that have changed so rapidly in recent years. In addition, the parameters associated with the content and all the example problems are more in line with the device characteristics available today. Some devices, no longer available or used very infrequently, were dropped to ensure proper emphasis on the current trends. There are a number of important organizational changes throughout the text to ensure the best sequence of coverage in the learning process. This is readily apparent in the early dc chapters on diodes and transistors, in the discussion of current gain in the ac chapters for BJTs and JFETs, in the Darlington section, and in the frequency response chapters. It is particularly obvious in Chapter 16 , where topics were dropped and the order of sections changed dramatically. You can study all of the content if you get this book with buy a book Electronic Devices and Circuit Theory 11th edition by Boylestad or read e-book of Electronic Devices and Circuit Theory 11th by Boylestad according the link that we given below. And now you can click the link below to take free download e-book of Electronic Devices and Circuit Theory 11th Edition by Boylestad from external server.